- It is the first toothpaste to be recognized by the Vegetarian Society of Londoan. 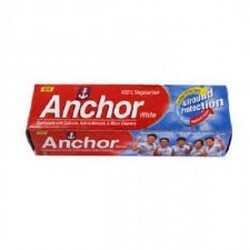 Anchor Gel comes with a unique germ fighter 'Anchor Grip Formula', containing Active micro cleaners and a cool mouthwash. Anchor Gel, apart from being approved by the Vegetarian Society of London, is also approved & certified by the British Dental Health Foundation, London UK. Anchor Gel comes with a unique germ fighter Anchor Grip formula containing active micro cleaners and a cool mouthwash.